A blog discussing the problems that can occur with implants. Dental implants have been in use since the 1970’s and have been an up and coming innovation over the last 40 years. They have provided a solution, and for many a boost in confidence for those that have lost their teeth in an accident or because of gum disease. One example of the problems which can evolve as a result of failing to look after your implants is a bacterial infection called peri-implantitis, the infection develops around the implant which can threaten the survival of the implant. Cases where this is happening are unfortunately on the increase. Smoking is one of the factors which can contribute to the development of the disease, some patients who have had implants continue or take up smoking and this can have a devastating impact on the oral hygiene of patients. As with natural teeth, implants need brushing and flossing just as regularly, such activities are even more instrumental after dental implant placement as it will help minimise oral bacteria that can damage the gums and the underlying bone which could compromise the dental implant. Your dentist’s role is to determine your specific self care needs and advice will differ depending on your lifestyle and the type of implant used. Immediately after the surgery it is advised that you use the mouthwash you are provided with and continue with this for 1 week. It is also recommended that you use hot salt mouthwashes to assist with the healing . It is important to attend regular follow up appointments after your surgery and to ensure that your general oral hygiene is of a high standard . This is one of the causes of late implant failure; it is where there is a gradual loss of bone in the area supporting the implant. It is a relatively new disease and experts say it did not exist 10 years ago. It is thought that the increase is due to advances in implant design. Today implants have a far smoother surface compared with a rougher surface used in the nineties which seemed to integrate more successfully with the bone. The smooth surface is more likely to retain bacteria if the bone shrinks away from it. If you are worried about any of the above contact your dentist. We have acted for clients where there has been a failure to diagnose and treat peri-implant disease which has led to devastating consequences for the client. If you are concerned about the treatment you have received please do not hesitate to contact our specialist dental negligence team for further information. 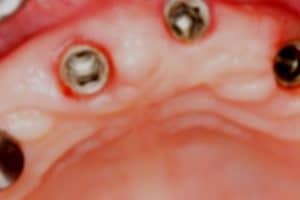 Peri-implantitis. Part 1: Scope of the problem, A. Alani, M. Kelleher & K. Bishop,British Dental Journal, September 2014, pg 281-287. Care of the mouth after dental implant surgery under local anaesthetic, Guys and St Thomas NHS Foundation Trust, May 2013, Leaflet number: 2845/VER2. A Dentist’s guide to implantology, 2012, Association of dental implantology, 98 South Worple Way, London, SW14 8ND, Catherine Drysdale, Koray Feran,Philip Friel,Stephen Henderson, Craig Parker, David Speechley, Cemal Ucer and Simon Wright.